This page is dedicated to the scouts that have come before us. The actions and participation of these scouts have shaped Troop 40 and established the reputation of excellence that we strive to live up to today. I will try to give you a history of Troop 40, as I know it. I joined the troop in September of 1999 with my son, Tommy, then a first class scout. The troop was the most active one in the Lockport area. It traveled far and wide with Scoutmaster Joe Kerwin. Joe was Scoutmaster for 42 years until his untimely passing in 2001. Troop 40 celebrated its 50th anniversary in 1999. Several trips to Philmont Scout Ranch, a trip to England, several trips to Canada, Camp Dittmer every summer, Washington D.C. ,Gettysburg, PA., Florida Seabase, and Maine High Adventure were some of the adventures of Troop 40.Joe was very good friends with a Canadian scouter named Roy Reid. Roy and his wife, Audrey, became close friends of Troop 40 and many boys remember our winter campouts at their cabin north in Canada. The troop has owned several of its own buses used in all these trips. Joe kept the troop on the move with constant fundraising such as an annual Strawberry Festival, Niagara County Fair food stand, Snow cone selling, chicken BBQ’S, Chicken chowder, candy bar, and pepperoni sales. These fundraisers supplied money to the troop as well as the boys accounts. 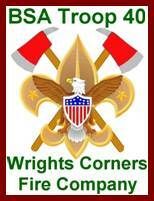 Troop 40’s original charter was with the Wrights Corners Presbyterian Church located at Routes 104 and 78. After a few years they moved the charter to the fire department where it remains at present. Joe Kerwin was a longstanding fireman and officer. He lived for scouting and the fire department. At one time in the late 1960’s early 1970’s the troop was about 90 scouts strong. He then split the troop in two and assigned two assistants as scoutmasters that would report to him. I joined the troop when it about 40 boys. They attended Florida Seabase in April of 2001. While visiting Disney World, Joe had a massive stroke while waiting on the bus. He was rushed to the hospital, stabilized and then transported back to Newfane. There a week later he died. It was a very sad time for Troop 40. At this time the committee looked to me and asked if I would be interested in taking over the scoutmaster position .My reply ,after asking my wife, is that I would do it for a year. That was May of 2001! The troop was down to 12 scouts when I took it over. Presently it is 38 strong. In 2001,the troop has attended Florida Seabase, 2001 National Scout Jamboree, Camp Dittmer, 2002 Tennessee house boat trip with a side trip to Kings Island amusement park and Football Hall of Fame. In 2003, 17 scouts traveled to England to visit with the 1st Atherstone scouts. We were there for 15 days. In 2004,we had a tremendous influx of first year campers. We attended Sabbattis scout reservation in the Adirondacks and visited the Olympic venues at Lake Placid. In 2005, 8 boys and 4 adults attended the National Scout Jamboree and summer camp at Camp Dittmer. 2006 holds a lot of adventure for our scouts. An April trip to Yaisers ranch in Tombstone Arizona is planned. 40 people will be traveling west. In August we will host the First Atherstone (England) scouts and leaders .We will be visiting the Massaweepie scout camp and a side trip to the Thousand Islands with them. We are all looking forward to the coming year. This isn’t a complete history of the troop as I’ve only been around for 6 years out of the 60 years the troop has been around. If Troop 40 is still around when this is read, it will be 110 years old, give or take a few years. The history keeps going because of the involvement of people like Tim Brounschiedel whose father was an assistant scoutmaster in the 70’s. Also ,Karl and Millie Hoefer who remain active in the troop even though their sons are out of the troop. Karl’s dad was also an assistant scoutmaster in the 60’s.It’s people like these that keep Troop 40 going and one of the strongest in the Niagara district.